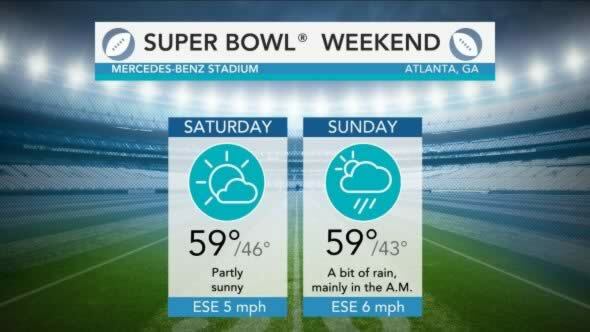 AccuWeather-(ENEWSPF)- The Los Angeles Rams and New England Patriots will meet at Mercedes-Benz Stadium in Atlanta to determine who will be crowned Super Bowl 53 champions. 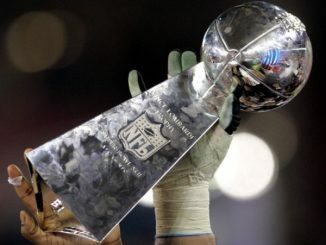 The Patriots, appearing in their third consecutive Super Bowl, will play for their sixth Super Bowl title. The Rams look to be crowned Super Bowl champions for the second time in franchise history and the first time since the team moved from St. Louis in 2016. Fans traveling from out of town and taking part in the various events throughout the city can expect ideal weather leading up to the big game. 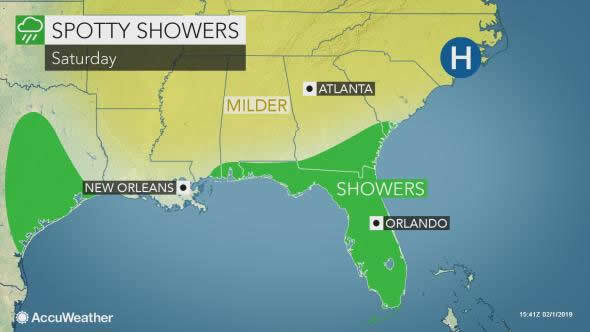 The chilly weather from earlier this week has departed the Atlanta metro area, with highs near 60 degrees Fahrenheit and sunshine expected through Saturday. A storm set to track across the Southern states can bring some rain to the region late Saturday night into the first half of Super Bowl Sunday. People tailgating and attending concerts and other activities ahead of the game should come prepared with rain gear. 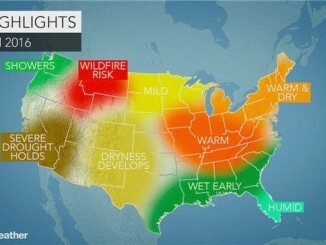 Sunday’s high will be around 60 F, with light winds expected. Any rain is expected to exit the area well ahead of the 6:30 p.m. EST kickoff time. Reuters reported on Thursday that the Mercedes-Benz Stadium roof is expected to be left open for the game. Stadium officials were still awaiting a final decision from the NFL. The target temperature to open the roof is 60 F.
“You don’t get a lot of wind in here when [the roof is] open, so I don’t expect wind to be a factor,” Mercedes-Benz Stadium General Manager Scott Jenkins told Reuters. Temperatures will fall through the middle 50s F during the game, reaching the lower 50s F by the time fans filter out of the stadium following post-game ceremonies.